It was indeed heartbreaking when we learned that Her Majesty, Queen Blessing Achenyo Alfa has made advancement through the path of glory and perfect rest. Her charismatic gesture, intelligence and affectionate concern for humanity and social reform will never be forgotten. 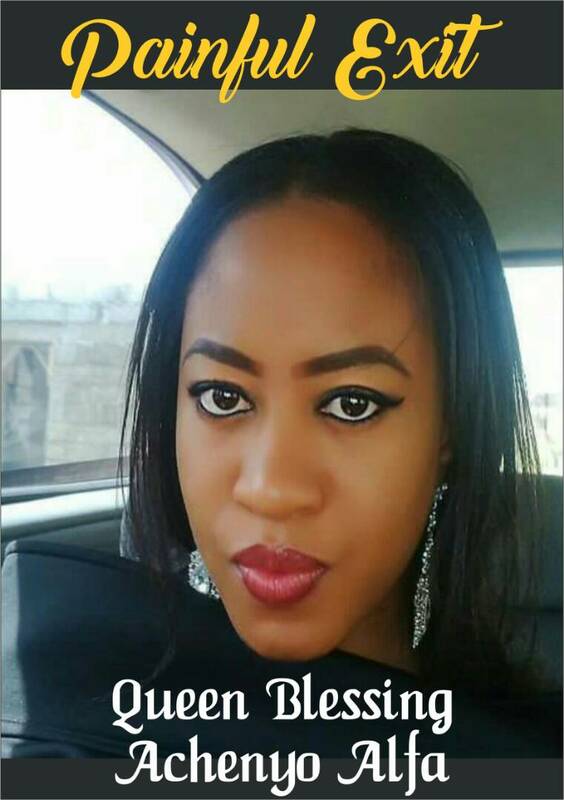 Unfortunately, several faithful friends have managed to nurse the loss of their sister, friend, colleague, role model, mentor and beauty Queen. The sad news gave birth to series of heart-felt deliberations and questions that challenged the love of God for humanity, "why should such a young lady with the heart of an Angel be made to leave the surface of the earth this early, God in his infinite should have considered her contributions to mankind, but we cannot question God", this was the expression of her friend, Eniola when she spoke with our reporters. 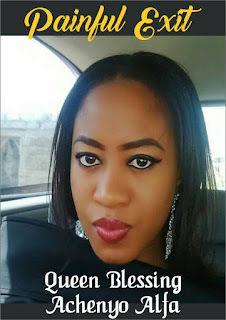 In a tribute written to towel the tears of crying relatives and friends over the loss of Queen Blessing Alfa, the significance of her affectionate relationship with friends, colleagues and family was carefully highlighted; it says "Oh! 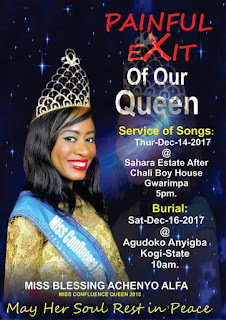 Death why would you feed us with painful memories of our beloved friend, sister, Beauty Queen and a motivator who sacrificed everything at her disposal to make us happy? This is a loss we cannot recover from for a long time! A heartbreak that will leave a scar till we all join you at the great beyond". Queen Blessing Alfa played several roles in different ways to all of us. ‎she was selfless and personally involved in all that concerns us in sincerity and humility. In tears, we wished we could turn back the hands of the clock to where destiny cannot eternally separate us but it's unfortunate. We were all hopeful together for the future as we conglomerated in the same proximity but as man proposes God disposes. As we met her in different places, events and circumstances, she left indelible mark‎s in our lives and times. Tears roll down our cheek with the thought of her unprecedented demise which has left us all in shock and disbelief. Late Blessing Achenyo Alfa as a promising young entrepreneur who believed in her craft empowered a lot of youths through seminars to impact on generations. Indeed, leaving a footprint on the sand of time. She was celebrated, honoured and embraced by all and sundry especially as he displayed high level of simplicity and humility to all who had encounter with her. High profile fashion events and pageants had the colourful impacts of ‎her Ankara bags and shoes on display as supports for us, Her noble personality on red carpets arrested attention from distance and her prayers at our challenging times uplifted our spirits but her forever absence cripples our strengths at this moment! 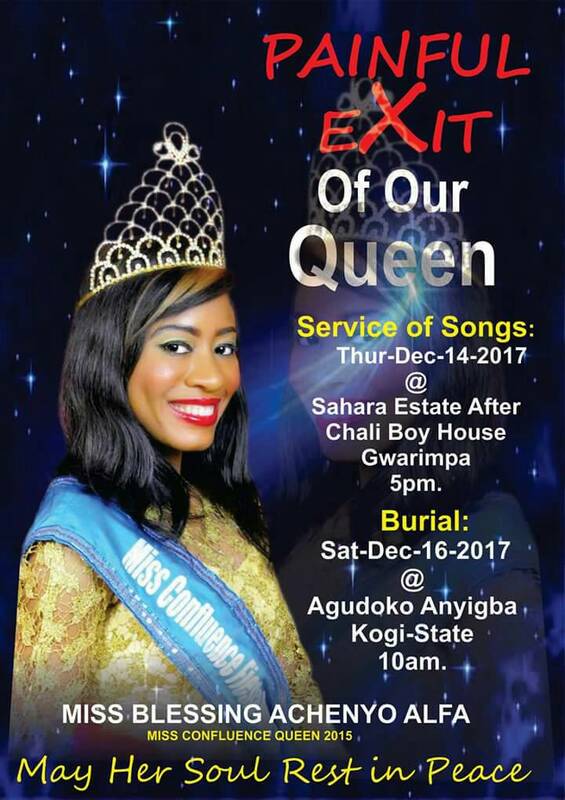 Queen Blessing Alfa your step into the ladder of beauty queens to make impression has been cut short, we bleed, we can't express how much pain we feel but in our hearts, you hold a special place till we meet to part no more. In Peace may you find absolute rest, our beloved friend and human enlarger.